We love this program because of it’s natural progression; you learn skills that compound on each other, ensuring you never become overwhelmed, but are always learning. It’s accompanied by an audio CD recorded by a professional band, and you can pan the CD to hear more or less of the drum part. That way, when you don’t know the part, you can turn it up, and when you want to practice your own fills, you can turn the drums off! Each FastTrack course uses the same songs, so friends can each learn an instrument and start a band with the same repertoire! Great if you have kids who want to learn different instruments. You can learn drums at home with our amazing program; don’t worry, with electric drums or special pads, it’s easy to mute the drums enough that you won’t draw any glares from the neighbors. Learning at home makes people feel more comfortable, and draws out the best music from them, so we strongly endorse this practice! Book your first lesson today. Creativity shapes our world. It’s what sets us apart from every other species on the planet; the ability to think about our choices, think about our own thinking, and reshape our patterns into something new. When you see a totally creative person, someone who is unabashedly themselves, you might say they march to the beat of their own drum. That’s an undervalued, absolutely essential trait. Every person alive has something unique to contribute to the universe, because no one else can possibly have their experience; no one can ever create in the same way they can. The world moves to a beat; we are the players; we are the students. We each add our own flair, our own rhythm, in the endless dance we undertake together. You can see this synchronization all over the place; you might find it in a boardroom, where people are tossing ideas back and forth. You might find it in a parent playing with their child. You’ll definitely find it on a dancefloor, where the rhythms take the body and mind into transcendent bliss. Everyone dances to a good beat. That’s why you should learn the drums. To trace the history of drums is to trace the history of music; a beat, after all, is music’s core, it’s pulse. 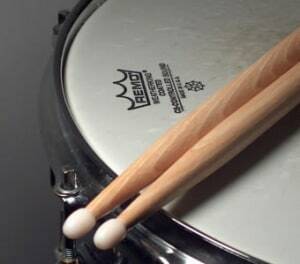 The earliest drums date back to millenia ago, somewhere between 5500-2300 BCE, though we have no doubt people were hitting sticks together rhythmically before this era. When we talk about drums today, we’re usually referring to a drum kit. While a wide variety of percussive instruments can be found in a drum kit, a typical kit will have some combination of a hi-hat, snare drum, bass drum (with a foot pedal), ride cymbal, crash cymbal and tom-toms. The first successful foot pedal was created in 1909, and since then drum kits have become ubiquitous in popular music, the charge for the kits having been lead by jazz drummers in the 1920s. These kits are incredible, because they reduce the number of members you need in a band; instead of requiring a different percussionist for each percussive instrument, one drummer can create an incredibly intricate rhythm. Drumming is an incredible discipline. It combines chaos and order in a way little else does, which means practice in drumming will teach you great skills for real life. Rhythm is a constant; it’s between the notes, it’s even found in silences, when you feel your blood pumping. What a drummer does is unique; they find a way to represent omnipresent rhythm to create a pulse for the rest of the band to follow. That’s where the order comes in; a great drummer is “in the pocket”; playing in perfect sync with their band members, never off beat, always in time. 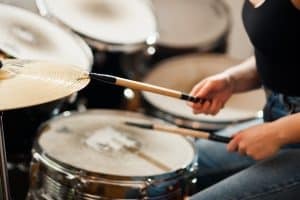 At the same time, the drummer can change how the pulse feels, even while keeping the beat; there are such a plethora of ways to play 4/4 at 120 BPM, it seems strange to even call them the same rhythm. The things you learn from this discipline, from applying chaos to order, and order to chaos*, are incredible. When you learn to drum, you learn limb coordination like you’ve never known. Try tapping a rhythm with one hand, a different rhythm with another hand, and a different rhythm with each of your feet. It’s really difficult at first, but experienced drummers can play things you wouldn’t believe possible. That’s because they feel the beat, so what seems to be a dissociated series of taps to one person becomes a complex rhythm in a drummer’s capable hands. In order to learn this, you need practice, practice practice; hours at the kit, feeling out rhythms, playing slowly at first, then more quickly until you’re up to speed. You need to develop creative thinking, as well. A band can keep the beat with a metronome, but a drummer needs to take that beat and make it groove. As you continue to play, you’ll learn what the right flourishes are for each moment in the song just by feeling it. You’ll learn to read time signatures, notation, and more. You’ll learn about music theory, history and more. It’s like learning a new language, a new way of thinking, incredible dexterity, emotional and rational intelligence, all in one. In short, drumming is one of the greatest practices you can take up, and it’s benefits are innumerable. You can even use it as an exercise regimen! All the benefits you’ll find from drumming are available to your child, too! They’ll develop all of the intelligences and skills associated with learning music, as well as self-confidence as they master a new and difficult skill. The socialization that can come with drumming is pretty incredible, too; drummers will be in demand so long as we’re making music, because everyone loves a good beat. They’ll make friends, get a workout, and develop their minds; what more could you ask for as a parent? *If you don’t understand this seemingly paradoxical statement, listen to Keith Moon drumming. Ordered chaos.